The Open Web Fellowship program empowers the next generation of open Internet leaders and advocates by embedding them at leading human rights and civil society organizations from around the world, where they can positively impact the health of the Internet and bring critical strategic expertise to the organization. Open Web Fellows are an amazing and diverse group. They are cryptographers, community organizers, educators and makers from around the world. Research ICT Africa, the only African organisation selected, will be hosting a 2017 fellow in Cape Town, South Africa. The Fellowship gives an individual the opportunity to work with RIA, and benefit from the expertise of its staff and research environment to work on a project for a sustained period. The call for fellowship closes Sunday May 21, 2017 at 11:59PM PST. The open web fellow is expected to contribute to the specific project stated but will be encouraged to learn about other RIA projects. We would like to involve the Ford-Mozilla fellow to work on our broadband performance and technical internet measurements project. S/he will be a valuable resource to the development and implementation of this research. We would like her/him to work either on the improvement of MySpeed Test, an open source app originally developed at Georgia Tech and that we have historically used to collect data on broadband performance; or on the collection and analysis of technical internet measurements on performance, internet peering, and users behaviour with any other tool or app. As we move towards the collection of longitudinal and cross-country indicators on broadband performance and mobile usage, our research makes use of specialised mobile apps that track internet behaviour of users. All data collected is anonymised and data is used exclusively for academic purpose, but we want to be sure that our research is conducted in a transparent way for our users and respecting their privacy. Therefore, we would like to involve the fellow on the discussion around privacy, surveillance and data tracking challenges that we may encounter as we work on technical measurement projects. As this field and our QoS team, is very dominated by men we would particularly welcome a female fellow. The Fellowships are designed to allow for flexibility for both Fellows and their families. The standard fellowship offers a stipend of $60,000 USD*, paid in 10 monthly installments. Fellows are responsible for remitting all applicable taxes and other government payments as required. To help offset cost of living, the fellowship also provides supplements for childcare and health insurance, and helps pay for research/equipment and books. The fellowships also covers the costs of required travel for fellowship activities. All approved fellowship trips – domestic and international – are covered in full. Please fill out the application form, which requires a resume, answers to several questions, and a proposed project description. Questions about the Fellowship itself can be directed to openwebfellows@mozilla.com. Any inquiries about Research ICT Africa itself can be sent to ecalandro@researchictafrica.net. Sign up here for RIA updates. Public Wi-Fi/Open access models in developing countries- Access solution or supplementary model? 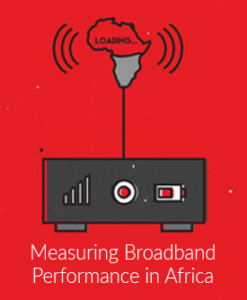 Participate in a Mobile Broadband Performance Study!